﻿ Leave cutting machines and cutting work to ITOTEC. 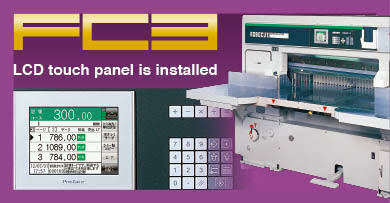 Leave cutting machines and cutting work to Itotec. We are a manufacturer of the cutting machine that cuts paper and so on. Not to mention computer installation in the paper cutting machine for the first time in the world, our assured technology has obtained reliability and praise not only in Japan but also in paper cutting fields all over the world. The paper cutting system matching customer’ s needs can cut not only paper but also rubber, plastics and glass fiber. Itotec will keep meeting various “cutting” requests with advanced technology. Check the motion of the cutting machine or that of peripheral devices in a movie. 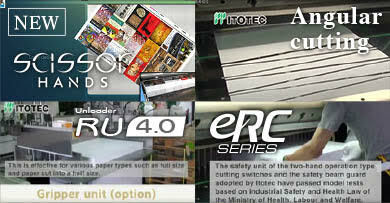 Contents related to Itotec’ s products and cutting technologies will be added later. Cutting machines overhauled with genuine parts to regain a high quality. Excellent precision with superior cost performance. “Adjust to shifts in register marks.” “Automatic waste treatment.” Helpful functions not found in competitors’ machines having been prepared thanks to deep knowledge into cutting job sites support work! Cut materials other than paper! Various examples and know-how in cutting are introduced. 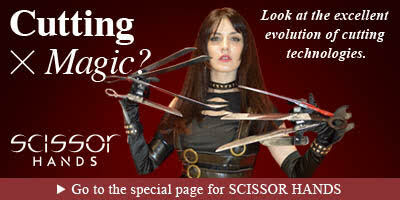 Lots of cutting examples of materials other than paper are introduced in this special site. The desired layout and cutting system can be established. Flexible to meet requirements of irregular layouts. We can meet requirements for extraordinary mechanical motions and dimension changes. Use of an exclusive CIP4 logo is granted. e-mail delivered from CIP4 organization is here. General catalog of eRC Series paper cutting machine. eRC Series paper cutting machines have always been at the top in view of the accuracy, ease to operate and safety in paper cutting. For opinions requests to the products of ITOTEC contact.